BHIM or Bharat Interface for Money is an app that allows you to transfer money. The app is user friendly and allows payments to be made in a matter of few minutes. The BHIM app is based on the UPI (Unified Payment Interface) platform made by the National Payments Corporation of India. It allows you to transfer funds without the payee’s bank account number, instead you can use the mobile number or the Virtual payment address of the payee to make the payment. UPI or Unified Payment Interface is a payment mechanism designed by National Payments Corporation of India (NPCI) which is regulated by the RBI. The interface is designed on the existing IMPS infrastructure and enables you to make instant fund transfers between two bank accounts. How quickly can you transact on the BHIM app? Transactions carried out on the BHIM app is usually completed within 20 seconds. A notification in the form of an SMS is immediately received after the transaction is completed. Does the BHIM app have any transaction charges? There are no transaction charges for using the BHIM app to transfer money. Banks, however, can levy a nominal charge as IMPS or UPI transfer fee. Once you have all of these things in place, your bank account needs to be linked to UPI for you to start using this app. Does the BHIM app allow you to send money to anyone? As long as the payee has an UPI app or the Virtual payment address, you can transfer money to him/her. The BHIM app is based on the UPI platform that allows you to transfer money between bank accounts. The payee’s account should be from a bank that supports UPI. Most private banks and all national banks are a part of UPI. You can make a transfer by adding the account number and the IFSC code. What if decide to opt for a mobile service provider? You can continue using the BHIM app irrespective of the mobile operator. What if decide to opt for a different handset? Once the verification is complete, your account details will be restored. 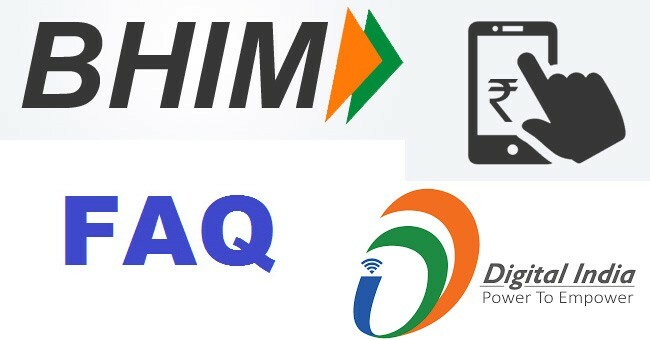 How to use the BHIM app after changing your mobile number? Note- The account only gets reactivated after a period of 24 hours. What are the safety features of BHIM? 1.You will be required to enter the access code every time you open the app. If the app in its open state remains inactive for a while then you are automatically logged out. 2.The BHIM app is phone specific. You can’t use your passkey or UPI PIN on a different phone. 3.To prevent unauthorized access, every transaction you make using the BHIM app requires the UPI PIN. 4.All the transactions on BHIM app are done over highly secure bank networks. The communication between the app and the servers of the bank are encrypted. The BHIM app can’t be accessed by a third person as it would require a password to access the app and the UPI PIN to make a transfer. You, however, are advised to get the SIM card blocked and notify the bank. Do you need to activate mobile banking for the bank account in question? Mobile banking is not required in order to use the BHIM app. You must, however, have your mobile number linked to your bank account. This allows you to receive notifications from the bank regarding any activity in your account. You have not received any notification in spite of carrying out a transaction. Why? Once you make a fund transfer through the BHIM app, you will receive a notification on the app itself. The notification SMS from the bank can get delayed due to network issues. If the notification is not received within an hour of the transaction then you are advised to contact the bank authorities. Are there any transactional limits in the BHIM app? What is the UPI PIN? The UPI PIN is a passcode (4 or 6 digits) that you need to set up during the initial registration process. The Pin is required for any transactions that you carry out on the app. In case if you have already set up the UPI PIN for other UPI based apps then you can use the same passkey for the BHIM app. Important note – You are advised not to share the UPI PIN with others. The BHIM app does not read or store UPI PIN details. How can you reset the UPI PIN? How can you see your previous transactions? Can multiple bank accounts be linked to the BHIM app? As of now, you are only allowed to link a single bank account. During the initial registration process, you will be required to link the bank account of your choice as the default bank account. In order to link a different bank account, go to the Main menu, choose the ‘Bank accounts’ option to select the default account. Any funds credited to you using your phone number or virtual payment address will be transferred to your default bank account in the app. Can the BHIM app automatically deduct payments from your bank account? No, the BHIM app can’t automatically deduct payments from your account. How does the BHIM app access my bank account information? The BHIM app is based on the UPI platform which is designed by the NPCI. It accesses your account details through your phone number. What can you do if the collect request does not come through? The first step is to check the internet connectivity. If you have added the payment address on the merchant app, then verify the address. Once you have verified it, carry out the transaction again. Open the pending transaction tab and check for the collect request. Setting up the UPI PIN when you don’t have a Debit card. In order to set up the UPI-PIN, the Debit/ATM card is required. You have selected the Bank name while linking your account with UPI, but the app is unable to retrieve your account details. In such cases, you need to check if the cell phone number used in the BHIM app is same as the number linked to required bank account. If this condition is not met, then the app will not be able to retrieve your account details over the UPI platform. Note- BHIM only supports Current and Savings bank accounts. Why is your UPI transaction not successful? In case your transactions fail multiple times, you are advised to contact the customer support. What to do if your bank account gets debited but your transaction fails? In case of transactional failures, the amount will be refunded to your bank account. This process can sometimes get delayed. It is advised to contact the customer support at the bank if you are unable to receive the refunded amount within an hour. The payee has not received the payment but my app is showing that the transaction has been successful. In some cases, due to glitches in the banking system the payment does not arrive in the intended time frame. It is advised to get in touch with the customer care if the payee does not get the required amount within an hour. Can you set your UPI PIN directly with your bank? You are allowed to set up your UPI PIN via any UPI enabled banking app. Are the any limits on the number of UPI transactions? Yes, you are only allowed to make 20 successful UPI based transactions from a bank account in a day. How can you make payments to online merchants through UPI? For online shopping, you can make payments via UPI if the merchant supports UPI based payments. In case they do, select the UPI payment option and add your virtual payment address (eg - abc@upi). Once the address is added, you will get a collect request on the app. You will now be required to enter the PIN to complete the payment. Who designed the BHIM app? The BHIM app was designed by the NPCI (National Payment Corporation of India) in collaboration with Justpay.